Leeds United owner Andrea Radrizzani has apologised for the “mistake” of appointing Thomas Christiansen and admitted he had been tempted to sack him earlier after ending Christiansen’s 35-game reign as head coach. In a wide-ranging interview with the YEP, United’s owner said he had given Christiansen “many chances” to prove himself and pointed to Leeds’ FA Cup defeat to League Two side Newport County last month as the result which ended his faith in Dane. 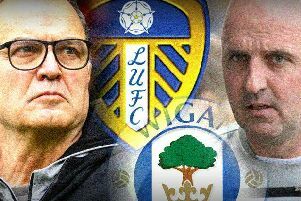 Christiansen was appointed by Radrizzani last June, a month after the Italian took 100 per cent control of Leeds, and he led the club to the top of the Championship in his first seven matches but a recent run of six league games without a win, culminating in Saturday’s 4-1 defeat to Cardiff City, led to Christiansen’s sacking on Sunday night. Paul Heckingbottom was named as his replacement within 48 hours, arriving from Barnsley after Leeds paid £500,000 to buy him out of his contract at Oakwell. Radrizzani accused Christiansen of failing “in terms of communication, leadership and confidence” and apologised to the club’s support for gambling on a coach whose prior experience consisted of three years spent managing in Cyprus. “Anything that doesn’t work is a mistake so yes, I did make a mistake,” Radrizzani said. “I apologise to the fans and the club, and for my experience I need to learn and analyse better my choice before making it. “At the same time, he seemed to be someone successful and fresh who could match with the new phase of the club, my new management and the new freshness around the team. “But if you watch the games we conceded so many chances early on, in the first few minutes. This is a sign that mentally the players are not relaxed. They are stressed and this is why I could feel that probably the manager was not transmitting security and confidence. I waited for a long time before taking the decision and gave him many chances. Already at the beginning of January I was really keen to change. Victor (Orta, Leeds’ director of football) convinced me to hold on. Radrizzani, who described the dismissal as a case of “now or never” in terms of Leeds’ bid to reach the Championship play-offs, said: “We need to share this responsibility but probably the job was a little bit too big for him at this point in his career. “I wish him good luck and success and he will have the time to grow but at the same time I think this league is competitive, very difficult and he probably lacked a little bit in terms of knowledge of the football. “More than that he needs to improve in terms of communication and leadership and confidence, which is a word I used a lot with him but it didn’t improve. “I had two situations that put me in the mind to change. First, the crazy Christmas period where we had four games in eight days. I was expecting (Christiansen) to manage the group in terms of changing some players. At the end, what happened was the opposite. Barnsley, under Heckingbottom, were 21st in the Championship when the 40-year-old walked out of Oakwell after two years in charge on Tuesday but he is widely regarded as a promising coach. Radrizzani said he believed Heckingbottom would be better equipped for the Championship, saying: “We want to have on board someone with a bright future but at the same time a knowledge of the territory. Someone fresh, ambitious and motivated to do well.